Linnaeus spent more than three years (1735–1738) abroad, primarily in Holland. Whether he was to be a teacher or a medical practitioner, he would need a degree, and he did not have one. He had not taken a doctorate in medicine. In August 1733 he began to write a dissertation on the cause of intermittent fever. He would later finish it and use the material in Holland to attain his doctorate. It was possible to take a doctoral degree at Lund and Uppsala, but only a foreign degree was considered sufficient. Holland enjoyed a reputation during the 18th century as being the home of medical science. 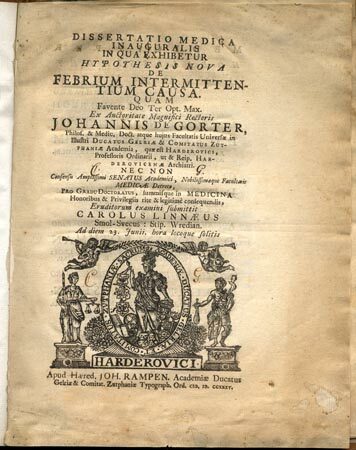 Linnaeus took his doctorate at Harderwijk in 1735 with the dissertation Hypothesis nova de febrium intermittentum causa. His time there was primarily devoted to botany and was important for establishing an international network. Linnaeus also attracted considerable international acclaim for his knowledge of botany. In terms of his medical career the stay was important because he won the close friendship and respect of a number of prominent individuals in medical science at the time. Leyden was where the charismatic Herman Boerhaaven (1668–1738) worked, a scientist whose contributions involved the mechanisms of inflammation, the kinetics of blood, and the importance of diet for the condition of blood. Linnaeus had a great many ideas about the genesis of diseases. They involve causal relationships of a rather general nature. The importance of hygiene, diet, breastfeeding, etc. relates to general medical views rooted in his own observations and how he makes use of the observations of other scientists. To some extent Linnaeus also takes up certain specific diseases or rather the emergence of specific symptoms. One such symptom was intermittent fever, that is, what we call “ague.” As mentioned, this was the subject of his dissertation. The word ague brings to mind malaria, of course, and malaria did occur in Sweden in the 18th century, not least in the valley surrounding Lake Mälaren. Linnaeus could not have known that malaria is caused by parasites and that these parasites spread to humans via mosquitoes. This was established by the British tropical physician Ronald Ross and the French military physician Charles Louis Alphonse Laveran in the 1880s (which won them the Nobel Prize). But among Linnaeus’ views about the causes of diseases we find the assumption Exanthema viva, which stands for the notion that contagious diseases are caused by the invasion of the human body by tiny organisms. Linnaeus was not alone in holding this view. 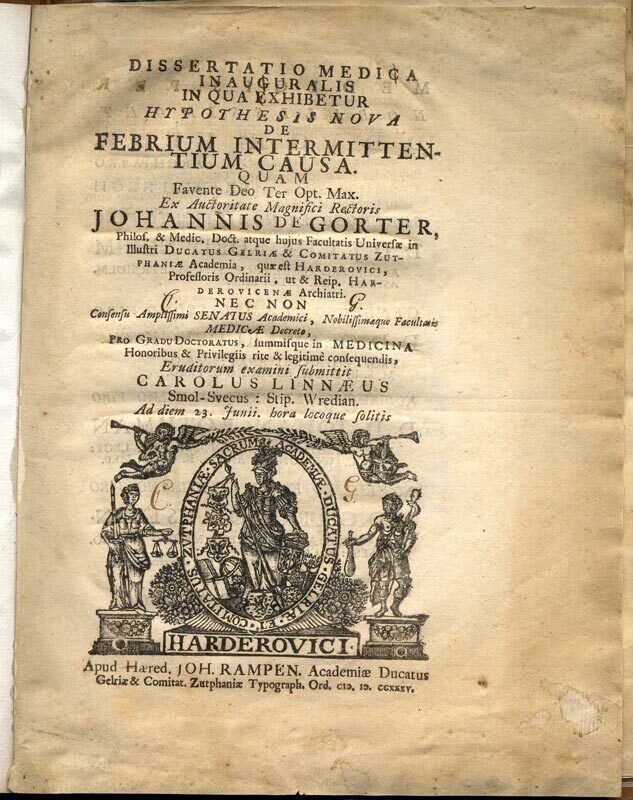 The Italian Lancisis wrote in 1717 regarding malaria and mosquitoes: “not solely via bites and stings but primarily thereby they inoculate their malicious fluids in our blood.” The explanation Linnaeus gave for ague varied in different periods, but what was central to his assumption was the proximity of standing water, moisture, and bad air (the literal meaning of mal-aria is “bad air”) which promoted the development of various organisms such as fungi and moulds. If the technology of microscopes had been more advanced in Linnaeus’ day, he might have come closer to the cause of malaria. With the benefit of hindsight, we can nevertheless establish with some admiration how observation and aggregated experience could lead remarkably close to an understanding of the cause of a disease.